It's been a rough winter so far. Cities across the country are reporting record lows and there's been lots and lots of snow. On a super-cold day when I am feeling a bit under the weather, there's nothing I like more than curling up on the couch with a hot water bottle and a cup of tea. The only problem with hot water bottles? Sometimes they get too hot (I like things to be just right!) and the plastic doesn't feel good on my skin. 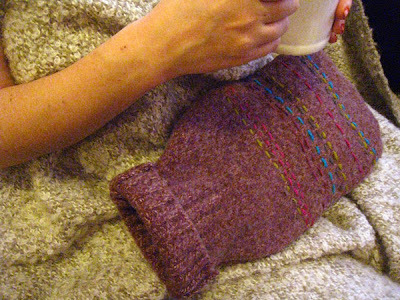 Here's a tutorial for making a super soft hot water bottle cozy with a felted sweater and some yarn scraps. First you need a felted sweater. If you're a crafty nerd like me, then you probably already have a bunch of them "just lying around" for a project like this and you can skip this step. If not, grab a large 100% wool sweater with a turtleneck and throw it in the washing machine on hot and then the dryer. 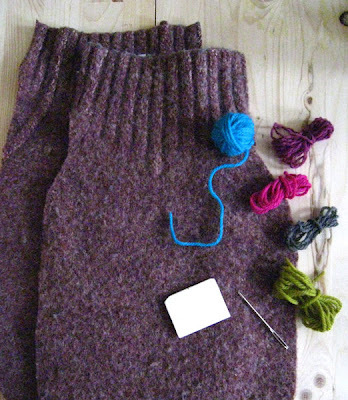 This process will bind the fibers in the sweater so that the yarns don't unravel when you cut through them. 1. 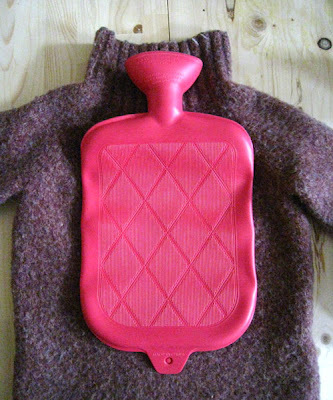 Lay your sweater out flat and lay the hot water bottle cozy over it with the top over the turtleneck as shown. Trace around the water bottle adding a 1/2" seam allowance all the way around. 2. 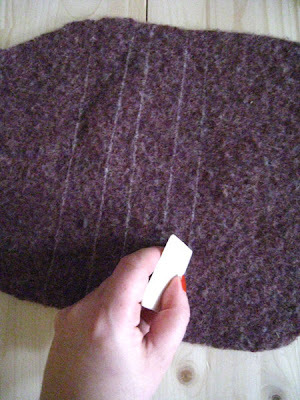 Following the chalk lines, cut through both layers of the sweater with fabric scissors. If you are having a hard time cutting evenly through both layers, pin the layers together first and then cut. 3. Now you are going to embellish the front of the cozy. Using your tailor's chalk again, draw a bunch of straight lines across the width of the cozy. You can make as many or as few as you would like. The lines can be even or random, it's up to you! 4. 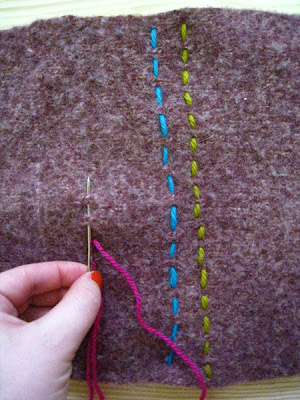 Thread the yarn needle with yarn, knot the yarn and sew a running stitch over one of the lines. Continue until you have sewn over all of the lines. I used a few different contrasting colors of yarn and varied the widths of my stitches for a little added design interest. 5. 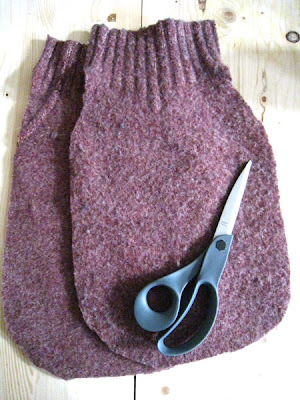 Pin the front and back of the cozy together right sides facing and sew with a 1/2" seam allowance around the cozy. 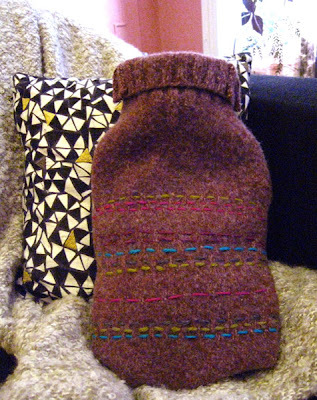 Don't sew across the turtleneck part: this is how you will get the water bottle into the cozy! 6. Trim the seams and turn the cozy right side out. 7. Voila! You have a soft and pretty cozy for your water bottle. Variation: If you can't find a turtleneck sweater, you can make an envelop opening for your water bottle to fit in. When you are cutting your pieces, cut the back part of the cozy about 3" longer than the front. Cut the back piece in half. When you pin the pieces together, overlap the two back pieces and pin to the front right sides in. Just in time. I was about to make a hot water bottle cozy. That is very clever with the turtle neck sweater. Love it!!!! How cute is this cozy?? Thanks for posting this. very cute! i knit a cabled one last year and lvoe it, may take your idea and make one for my mum though....goodwill here i come! I need the hot water bottle for my cold feet in the winter. Oh, I learned it the hard way not to put boiling water in the hot water bottle. It leaked and it was not fun. Oh this is fantastic, thanks so much for sharing! I'll be linking to this. this is so great. I am collecting HWB's to send to my brother who is a missionary in Nepal - they don't have heat there, and he said he could distribute them to his friends who could really use them to keep warm at night. i never would have thought to make a decorative cozy for this. how beautiful!! I've been using my rubber one with nothing covering it at all...how embarrassing after seeing such a well dressed one. easy to make but very special.